Round 3: Sl St in first V-stitch space, chain 3, DC-Ch2-2DC in same space. *2DC-Ch2-2DC in next V-stitch space* six times; join. Round 4: Ch 3, 2DC-Ch2-2DC in V-space, DC in next st, *skip 2 st, DC in next st, 2DC-Ch2-2DC in V-space, DC in next st* six times; join. Round 5: Ch 3, DC in next st, 2DC-Ch2-2DC in V-space, DC in next 2 st, *skip 2 st, DC in next 2 st, 2DC-Ch2-2DC in V-space, DC in next 2 st* six times; join. Round 6: Ch 3, DC in next 2 st, DC-Ch2-DC in V-space, DC in next 3 st, *skip 2 st, DC in next 3 st, DC-Ch2-DC in V-space, DC in next 3 st* six times; join. Round 17: Ch 1, SC in next 3 st, 2SC-Ch2-2SC in V-space, SC in next 4 st, *skip 2 st, SC in next 4 st, SC-Ch2-SC in V-space, SC in next 4 st* six times; join. Round 1: Ch 4, join. Ch 3, 9 DC in loop, join. Round 2: Ch 3, DC in same st. *DC in next st, 2DC in next st.* Repeat around; DC in last st, join. Round 3: Ch 3, DC around as in Round 2 (alternating 2 DC & 1 DC). Join. Round 4: Ch 3; 1 DC in each st around, join. Rounds 5-10: Repeat Round 4 until mittens reach desired length (mittens in photo have 10 rounds of DC). Round 11: Ch 1, SC in each stitch around, join. Finishing: Weave narrow ribbon or baby elastic through 2nd from last row to hold them on baby’s wrists. 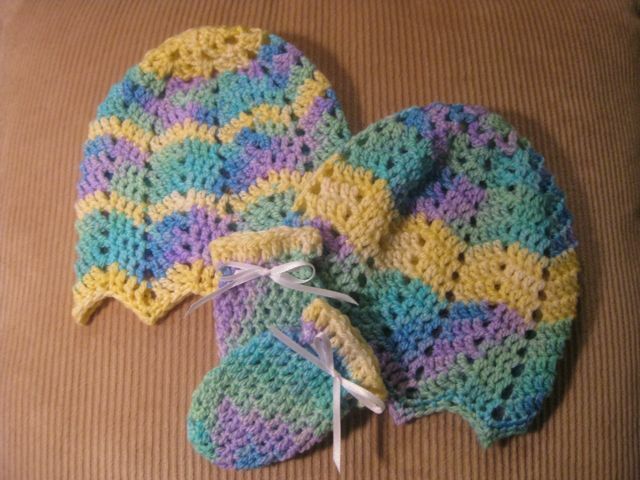 This entry was posted in Knitting and tagged baby, crafts, crochet, hat. Bookmark the permalink. This hat is so cute, I just printed it out. Can’t wait to try it. love them. now I can pair your cap with the afghan as a set !! We offered the Ripple Hat for baby, but some are asking for the little mittens pattern. Will you point us to the link for the pattern. Thank you for the hat pattern. Lyn is a very good friend of mine and is a moderator in our Angels4Preemies group. Today is January 4, 2010. I’d love to know the brand of yarn and colorway to make this hat. It’s adorable. I put the labels somewhere where I wouldn’t lose them, which of course guarantees that now I can’t find them. 🙂 They’ll turn up sooner or later, though, and I’ll post the yarns that I used when they do. I have been looking for a ripple hat pattern for a long time. I love it! I’m probably going to sell a couple of these in my Etsy shop. I will gladly give you credit for the beautiful pattern! Thanks so much for doing this!!!!! As requested, I’ve added the mitten pattern. Enjoy! They are adorable. I make baby hats for a hospital near me and I’m going to use your pattern for the next couple I make. Thank you for sharing your pattern. I like them. Could you give me a gauge on this or a finished size? I made one and its adorable but it looks big. Maybe i need to use a different size needle. Thank You. Thank you for this pattern. I would like to make these for gifts. I have 6 grandchildren, but they are too big for these now, but it would be nice for charity gifts also. Thanks again. Thank you for this pattern, it is so cute. I made it a little smaller because I was using Simply soft yarn. (don’t have any baby weight at the moment) I am going to get some baby weight yarn because I want to get the size of it with that weight. I work for a hospital(several actually) and I would like to make some of these for our baby units. Very cute! Do you know how this can be adapted to a teen/adult size? Just love the pattern and have made several for charity! While making these adorable little hats, I revised the directions for the beginning of rounds 4-16. I would like to recommend this pattern on Ravelry with the revised changes. I will be happy to email you the revisions with pics so that other interested crocheters can refer to your site for this adorable pattern. Thus far, I have made 7 hats of various sizes using your pattern with its revisions. It is a perfect pattern — newborns to adults — by simply adjusting size of crochet hook and type of yarn. Round 3: Sl St in nxt st and in first V-stitch space, Ch 3, DC-Ch2-2DC in same space. *2DC-Ch2-2DC in next V-stitch space* six times; join at 3rd ch of starting Ch3. Round 4: Sl St to st before V-stitch, Ch 3, 2DC-Ch2-2DC in V-space, DC in next st, *skip 2 st, DC in next st, 2DC-Ch2-2DC in V-space, DC in next st* six times; join at 3rd ch of starting Ch 3. Round 5: Sl St in first st, Ch 3, DC in next st, 2DC-Ch2-2DC in V-space, DC in next 2 st, *skip 2 st, DC in next 2 st, 2DC-Ch2-2DC in V-space, DC in next 2 st* six times; join at 3rd ch of starting Ch3. Round 6: Sl St in 1st, Ch 3 in 2nd st, DC in next 2 st, DC-Ch2-DC in V-space, DC in next 3 st, *skip 2 st, DC in next 3 st, DC-Ch2-DC in V-space, DC in next 3 st* six times; join at 3rd st of starting Ch3. THANKS SO MUCH FOR THE ADORABLE PATTERN!!! HAD BEEN LOOKING FOR SOME TIME FOR A PATTERN THAT WOULD WORK UP QUICK AND CUTE, AND REALLY THRILLED TO FIND A HAT PATTERN IN RIPPLE PATTERN. NOW I CAN MAKE HAT AND BLANKLET SETS TO DONATE TO MY LOCAL HOSPITALS. On the last round of the hat – are you sure there should be a skip two in there? The numbers just don’t add up right, unless there’s something I’m missing. Thank you so much for your pattern it should be a great addition to the blanket. Have a blessed day. I love this pattern! The directions are clear and easy to understand. I have a friend who’s having a new grandbaby in September and I wanted something new to make for him. Thanks to you I found what I was looking for! I am on rounds 7-16 where a correction was made on 1/5/10. I can not get round 6 to match up with round 7. Do I need to skip more than two st. Thanks for the great pattern! My first hat, and it works:) just one question: what does this mean: “[Corrected 1/5/10]”??? I’ll translate it into hungarian and publish on my blog, if you’re agree – with a link back, of course! Have you ever thought of doing a step by step video for youtube. I have tried this and I am not doing so good. I am not good at reading patterns, I do better with visual aids lol. Just a thought. I have a friend who reads patterns and she says she will help me. love the hat. Sorry if it’s hard to follow…I’m not an expert at crochet, so am probably even less of one at writing down patterns! Nice reworking of a ripple pattern! I made this in cotton worsted with an H hook for a friend’s new baby – a bit big, but they grow so quickly I wanted it to last more than a couple of weeks. I found that 17 rows was rather long, made it in 14 rows, and turned up the bottom to make an adorable pointed brim! For Margo, I don’t know where you can get free supplies but there are bzillions of knitting needles and crochet hooks for sale on ebay cheap. Yarn too. Some of them are estate sales. Good luck! I saw a previous post saying they had an issue with putting round 7 on round 6, but I didn’t see a response. It doesn’t match up at all, and I really want to finish this hat. Can you help? Hi everyone, I’m making little hats for preemies. Thanks so much for all the patterns and info. I’m just learning to crochet! called “Leaf and Lace”. Would any of you gals have this pattern? They don’t make the Paton’s book anymore and she loved this outfit for gifts. Sorry; it’s my first attempt at writing down a pattern. Maybe someone at your local yarn shop could help with what you’re stuck on. thank you so much for pointing this out, because this is exactly what I did and could not figure out why it was not coming out right!!! So cute, I love the mitts and the variegated yarn you used. I already LOVED this pattern and have made dozens of them. It is my go to hat because it is good for boys or girls but is fancier that just a plain hat for boys. I made 3 today. But. I am going to start one over using Maureen’s revision. The third one I used her revision and it just makes sense! Made a perfect pattern even better!! Thank you both!